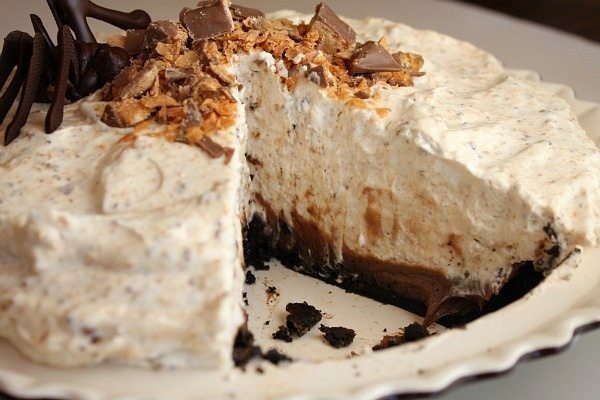 This Butterfinger Pie is a creamy and decadent pie recipe with plenty of Butterfinger candy bars swirled in. Adding candy bars to desserts is an excellent idea. Everyone loves a good candy bar, so when people find their favorite candy bar in a dessert… that makes them pretty happy. 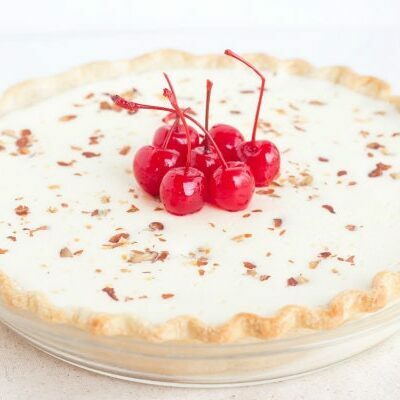 This is seriously the most creamy and delicious, decadent pie ever. The creamy filling is piled up a mile high. Look at those layers! It’s a big time treat. 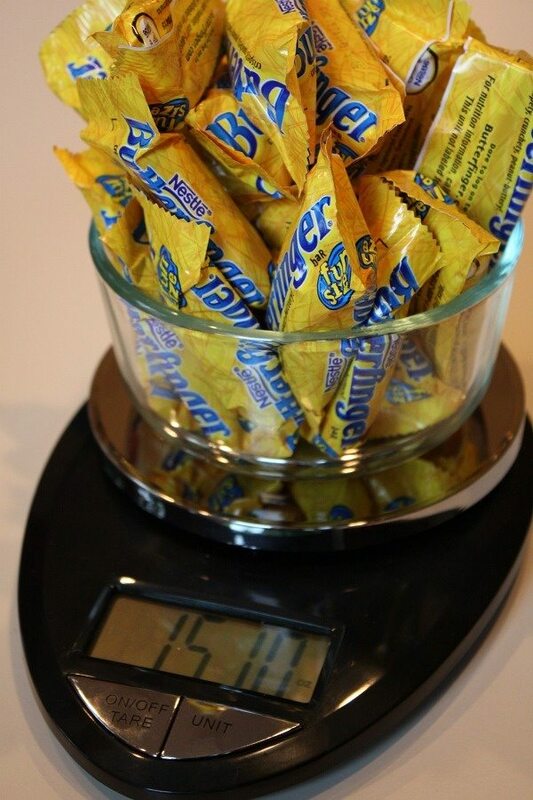 Fun-size Butterfinger bars are perfect for this recipe (if it’s around Halloween time, you can snag 23 of them from your kids’ trick or treat bags), or just use 15 ounces of Butterfingers. Use a kitchen scale to measure yours out. 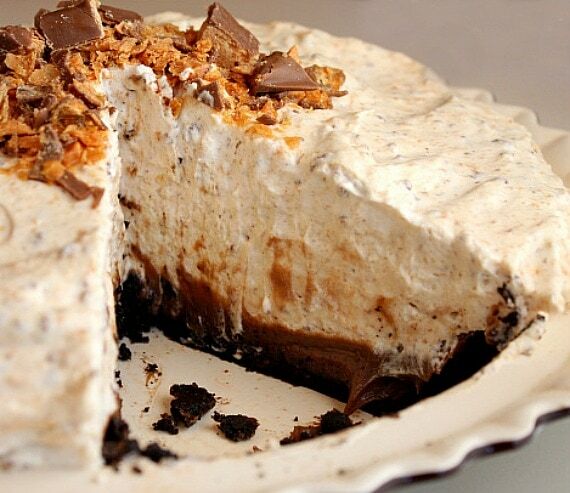 Be sure to get extra Butterfingers if you know you’re going to graze on them a bit while making this Butterfinger Pie. You’ll want ALL of the Butterfingers it calls for to go into the pie. Start with an Oreo crust. Then add the super creamy peanut butter layer. Finally, add the whipped cream layer with chopped Butterfingers sprinkled on top. 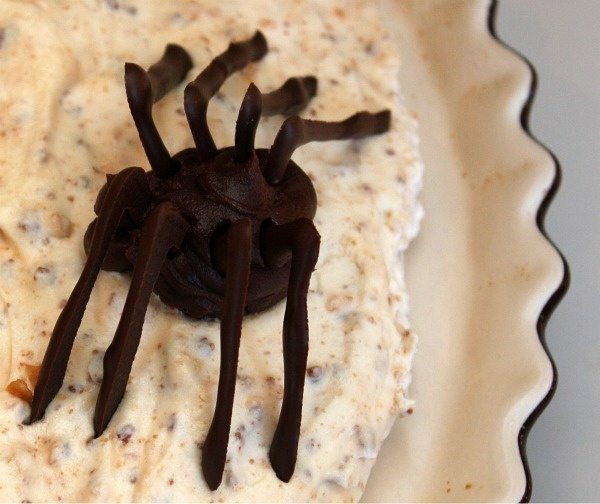 If you happen to be making this pie around Halloween time, these are some optional chocolate spiders that you can make to put on top. You can follow this chocolate spider tutorial. The body is made from a piped-on cooled chocolate ganache, and the legs are made from melted chocolate “7’s” that are popped in the freezer until firm. The legs are stuck into the sides of the spider to make complete spider bodies. I’m sure that some people think chocolate spiders are a little creepy. But they’re super fun to add to desserts around Halloween. Keep them in mind! The spiders are, of course, completely optional. 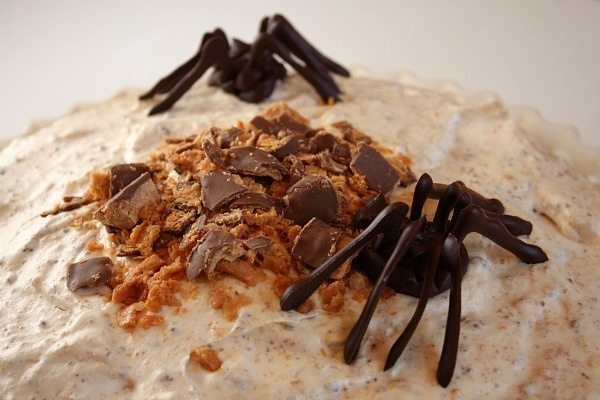 But they add a little bit of Halloween fun to Butterfinger Pie! This pie is as decadent as it looks. Go to the gym, get a long workout in, have a small piece of pie and a big glass of milk, and then go back to the gym. No kidding! It’s worth the splurge though. 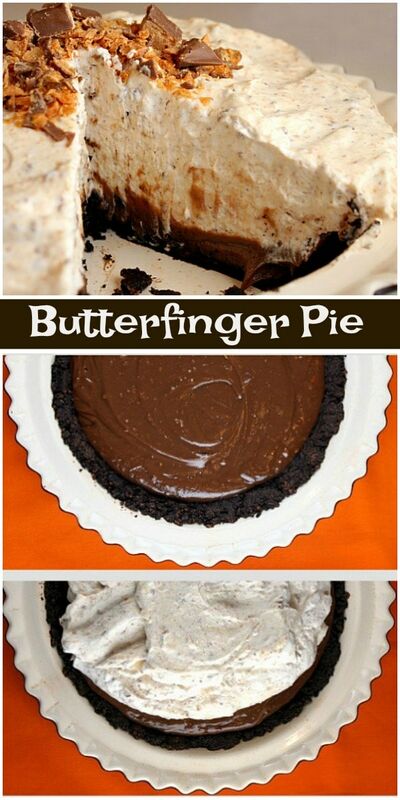 Grab some Butterfingers and make this pie- no baking required except the crust for a few minutes!! 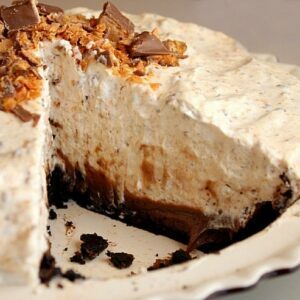 This Butterfinger Pie is so decadent and creamy and delicious! Preheat the oven to 375° F. In a food processor, process the cookies into fine crumbs. Add the melted butter to the crumbs and continue to process until well blended. Transfer the mixture to a 9-inch pie pan and press evenly over the bottom and up the sides of the pan. Bake for 8 minutes. The crust will puff up and shrink slightly. Use the flat bottom of a drinking glass to gently press down on the crust. Cool completely. In a food processor, process 20 of the fun size Butterfinger bars into fine crumbs. Divide the crumbs into two 1/2 cup portions and one 1 cup portion; set aside. In a medium saucepan, combine the sugar, cornstarch and milk. Slowly bring to a boil over medium-high heat, stirring constantly. Remove from heat. Beat the egg yolks in a small bowl. Whisk in the hot milk mixture 1 tablespoon at a time until the eggs are tempered (slowly warmed up). Then add the eggs to the remaining milk in the pan, bring to a boil, stirring constantly until the mixture is thick. Remove from heat and whisk in the peanut butter. Scoop out 1 cup of the peanut butter mixture and put it in a medium bowl; cover and set aside. Add the chocolate chips and 1/2 cup of the Butterfinger crumbs to the remaining peanut butter mixture in the saucepan. Stir until the chips are melted. Pour this mixture into the cooled crust. Refrigerate while preparing the next layer. 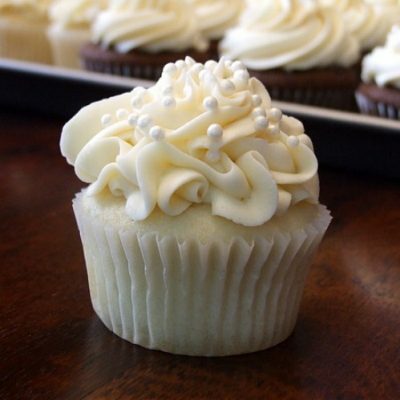 Use an electric mixer to whip 1 1/2 cups of whipping cream until stiff peaks form. Scoop into the bowl with the reserved peanut butter filling and fold together with 1/2 cup of Butterfinger crumbs too. 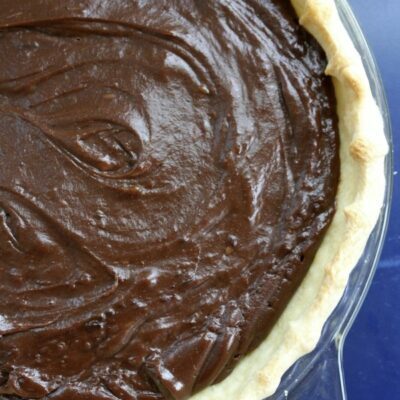 Remove the pie from the refrigerator and mound the peanut butter mixture evenly over the chocolate layer; spread to the edges. Whip the 2 cups of heavy whipping cream until stiff peaks form. Fold in the remaining 1 cup of Butterfinger crumbs. Spoon over the top of the pie, mounding slightly in the center. 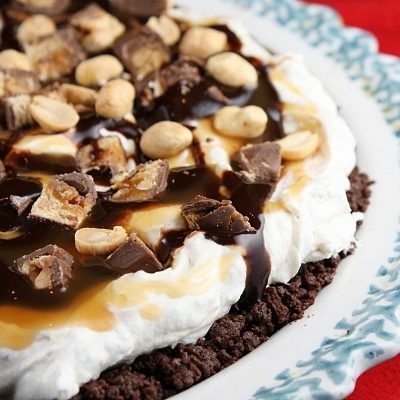 Chop the remaining 3 fun-sized candy bars and sprinkle over the top of the pie. Cover loosely and refrigerate until ready to serve. *If you don't have a food processor, throw cookies in a zip bag and smash it to smithereens. Candy bars too. *When preparing the filling, if you add the eggs to the pan before they're warmed up properly, you'll end up with scrambled eggs. 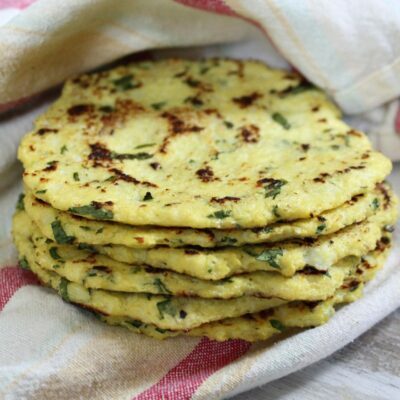 Warm them up slowly by adding the milk mixture a little at a time until they're quite warm. 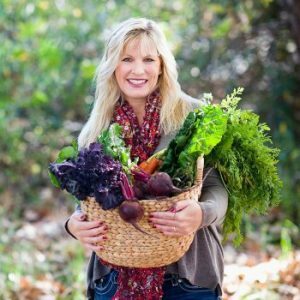 We love this recipe! We’ve made it several times over the past couple of years. One easy shortcut is to use store-bought Oreo crusts. But, these crusts are quite small. The filling of this recipe is quite a lot and easily fills TWO of the store bought crusts, enough that it’s still an awesome heaping mound of goodness. My family loves this pie, and my son asked for it for his birthday party. But, we always have more filling than fits in our standard pie pans, and it squishes out. So, this time I made a double recipe, but used 3 Oreo pie crusts and had more than enough filling to fill all 3 really full and piled very high with cream. Delicious! Made it last night and I couldn’t stay out of it. Definitely a keeper. I agree with Jessica’s comment. It is important to have the set aside cup of peanut butter chilled before folding in the cream. 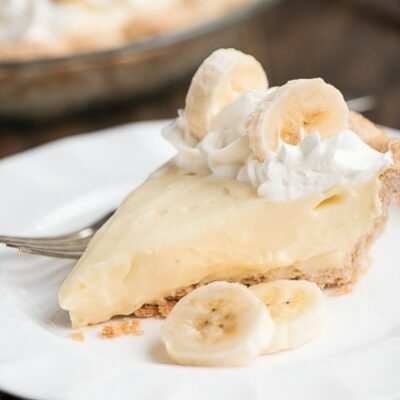 I would also add that it is important to chill the pie in the fridge to harden the first few layers before adding the final whipped cream layer. These are critical steps to having the pie turn out. 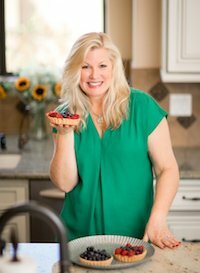 My family and I loved this recipe, it was delicious. I had one small hiccup though, when I mixed the peanut butter mixture into the whipped cream for layer #3 it completely melted the cream. I think that cup of mixture that you set aside, should be set aside in the fridge. Other than that it was fantastic!